I was walking on the treadmill this morning talking with my friend, Becca. It had been awhile since we had seen each other due to track-out and illness. We were warming up with a leisurely walk while we caught up with each other. She was telling me about her family travel plans, and I told her about my visit to the Athleta store at the Streets at Southpoint Mall in Durham. I received compensation for this post. All opinions and statements are my own. See Disclosure/Disclaimer page for details. “What do they have there?” she asked. ” Women’s athletic apparel,” I replied. “It’s designed to easily transition from the gym to errands,” I continued excitedly. “I need clothes like that,” she responded. “I live in exercise clothes,” she continued. “Me too,” I said. “They also offer exercise classes once a week led by a local fitness instructor/studio and sometimes they have kid’s yoga too.” “That sounds fun,” she responded. 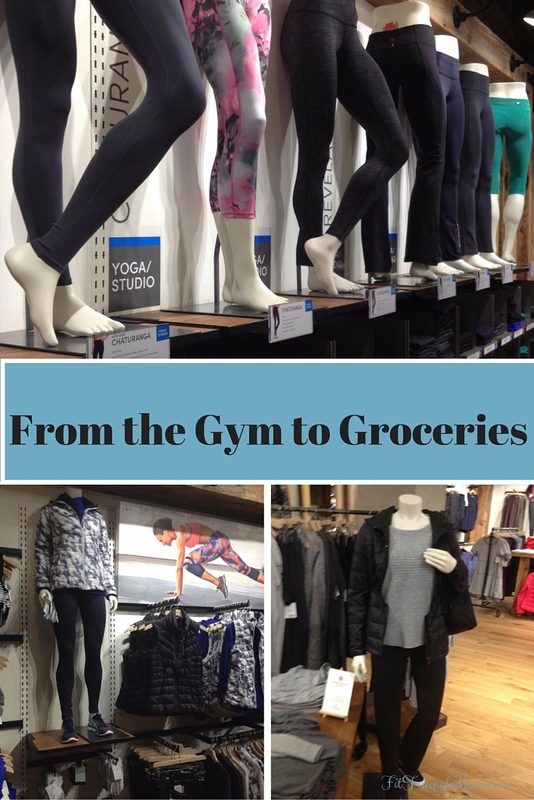 “They roll the racks and fixtures off the floor, and turn the store into a workout studio,” I continued. “Very cool,” she said as she looked down at her watch. I nodded. “We need to start running,” she said. I agreed as I tapped my Runkeeper app and my run music began. I was getting into my running groove when I felt my running pants begin to sag. I felt like I needed to pull them up. Then I felt my shirt rising up, and I was continually pulling my pants up and my shirt down. It was a bit exhausting in the midst of my run. I began to think about the Athleta “Give it a Workout” guarantee, Dionne (one of the managers at Athleta) told me about. I know I “saved” some money at the big box store where I purchased my current and cute purple running pants and top, but frankly they were uncomfortable. They sagged when I ran, and they didn’t “breathe” like the label said. I kept them because I already wore them and removed the tags. Dionne told me to save my receipt and give my Athleta purchases a test run, and if they didn’t work then return them, sweat soaked and tagless (they prefer you to wash your clothes before returning). It seemed a little too good to be true, but as I watched Dionne at work, I saw someone that believed in the product as well offering superior customer service. She spoke to every customers by name, asked them about their sport (yoga, running, HIIT), their favorite color, and she even offered to hold a crying baby while her mama tried on clothes (I’ve been that mama before). “We’re a family,” explained Dionne, a mother of 5 (the youngest is 5 months). People can be sensitive about sizes especially when you’re ‘working on it’,” she continued. “It’s about building a relationship and having fun.” Dionne and I had fun picking out the perfect running outfit for me. Running tights that didn’t sag, a top that didn’t ride up and sports bra to keep the D’s in place ( a must for running) plus a splash of my favorite color, blue. I choose the High Support sports bra for my large cup size and my primary activity is running. This bra was amazing! It had underwire. You can see in the picture above how they kept the girls up. I have friends that wear 2 bras for fitness support. You only need 1 High Support bra from Athleta to get the job done. I picked the compression tights for all-over support from my lower abs to my legs. These pants are breathable, so you don’t feel overheated during a run. I like wearing racerback tanks. The Fastest Track top is seamless and unstinkable, meaning you don’t have to wash it as often. I completed my look with the Tranquility Hoodie. I loved the color and it was super warm and soft for chilly days. I finished my run, and started my cool down walk. I turned to my friend, and told her how uncomfortable my run was, and how I sold myself on shopping at Athleta instead of “saving” for discomfort. Becca agreed. I didn’t let her get off the treadmill before telling her the most exciting part of my visit to Athleta Durham. 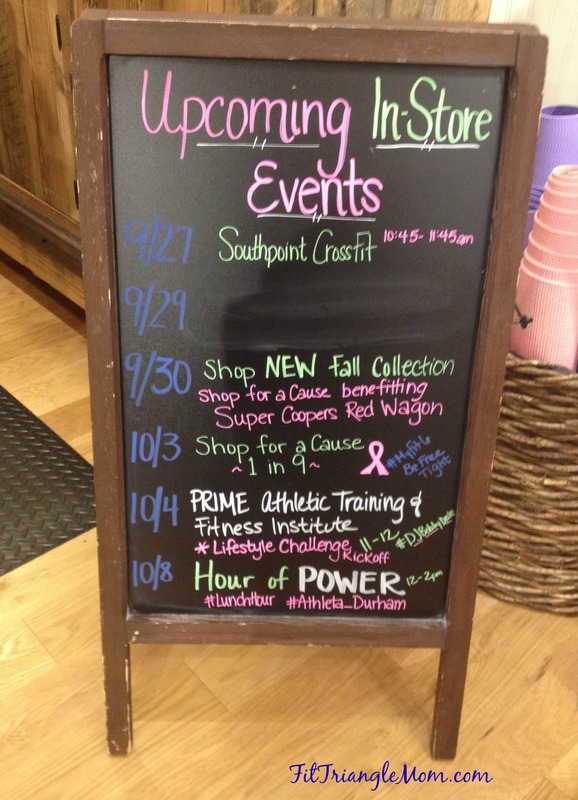 The store is donating 10% of all regular priced sales to Komen NC Triangle to the Coast for the month of October if you mention Fit Triangle Mom. Do you shop at Athleta? 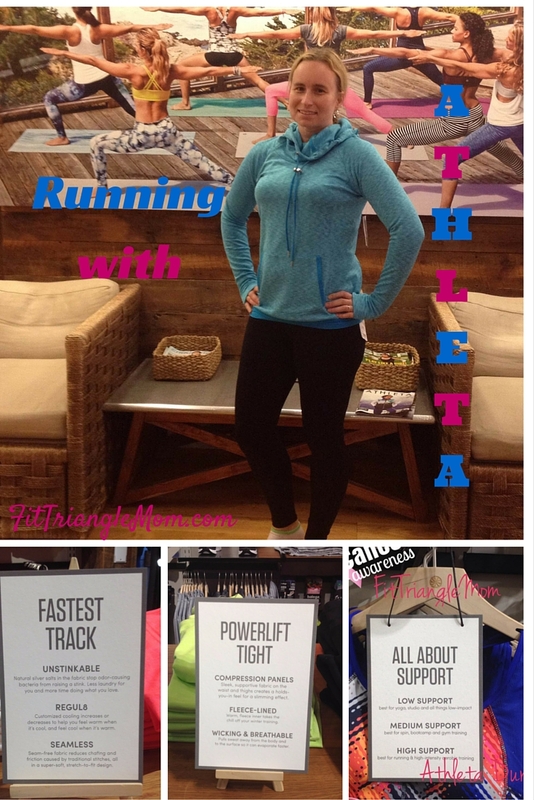 What is your favorite Athleta item? They have the best stuff! I have a cute skirt that has been washed and dried for YEARS and still looks new!!! Love the look! I love hearing about quality apparel. I wear my clothes forever. I learned a lot from my visit to Athleta. I buy running shoes that fit my feet and now I’m going to wear running pants that fit my body. I need that bra for every day. I heard they had a great return policy. I am going to have to take a road trip to visit. I loved that bra. Their return policy is wonderful, they encourage you to work it out and test it. If it doesn’t work bring it back. I’ve been looking for clothes that can work for the gym and elsewhere. You’ll like Athleta. Very versatile, stylish and comfortable.